Inherently, we like doing things in groups, as it makes our experiences more social. It’s not about what we’re doing so much as who we’re doing it with that makes our experiences enjoyable. Group messaging took off two years ago, overrunning SXSW, as a better way to keep groups of people engaged; Kickstarter has grown like a weed thanks to the power of the crowd lending legs to fledgling projects that need quick capital to get off the ground. What does that mean? Well, we all love Kickstarter, but if you’re looking to pool money to throw your friend a birthday party, for example, that ain’t going to happen on Kickstarter. For a good reason, but that doesn’t mean the crowdfunding model can’t work. Thus, Crowdtilt has built a site that makes it simple for groups of friends to organize things to do together, with the specific focus on making it easy for the organizer to collect money from anyone. How does that work? The site allows you to easily create a campaign, like “Help Hagan get to San Francisco” or “Phish Party Bus in DC,” while specifying how much money is needed for the campaign to actually happen — or in the startup’s lingo — “tilt.” You can then send this campaign out to your friends, who can authorize their credit cards for a certain amount with Crowdtilt. Like groupbuying, friends’ credit cards won’t be charged until the campaign has tilted, or in other words, the specified amount has been reached. Not dissimilar from Kickstarter in this way, especially as projects have a certain amount of time before they become defunct. Crowdtilt gives the organizer and friends 7 days to raise their total, and then shuts it down. And the startup, at least initially, isn’t taking a cut of credit card transactions. Although the need for a clear business model remains, Crowdtilt is trying to keep their platform as frictionless as possible in the early going to try to reach critical mass. Testing it out within the confines of Y Combinator, Crowdtilt Co-founder James Beshara says that the current YC batch used Crowdtilt to organize buying a communal pickup truck that current founders can use to move their stuff in and out of offices, etc., as well as using it to organize social events like BBQ’s. I mean, it’s deceptively simple: One person creates a campaign, anyone else can contribute, paying when it meets the benchmark. Bashara told us that the platform started under the auspices of a way for charities to efficiently collect donations, but he decided to pivot once he saw the idea taking off among groups of friends. Other unexpected use cases have emerged in early testing, like a couple in Denver creating a campaign for friends and family to contribute towards the cost of their wedding, rather than putting it all on the groom’s father. Crowdtilt currently has 3,000 users, and the number of campaigns has been doubling every seven weeks, with campaigns succeeding in raising 188 percent of the proposed total. And all this has come entirely through word of mouth. The team soon plans to add social features to their model, allowing people to follow their friends so that you can be quickly notified when they create campaigns. Unlike Kickstarter, there’s no requirement for users (or organizers) to specify multiple levels of rewards, apply, and wait for approval from management. Simply create a campaign and share it with the people who you want to share it with, pay when you get there. And it doesn’t just have to be your friends. I almost feel like I’m repeating myself, because the idea is so simple, but in that way it’s intuitive, and potentially savvy. The longterm goal for Crowdtilt is to become the default way to manage all group-based transactions online. Right now activity happens on the Crowdtilt portal, but the team wants to take the experience to other websites, where the UX of sites that rent hotel rooms, for example, could integrate the Crowdtilt model as another way to serve their customer. And that’s where revenue models would enter the picture. I don’t know, maybe it’s because it’s Friday, maybe because I’ve wanted to build something similar myself, I think Crowdtilt is really onto something here. Come on, trolls, you hate group email and “reply alls,” so when APIs spread this around the web, you can use it to buy a new couch for your mom’s basement. 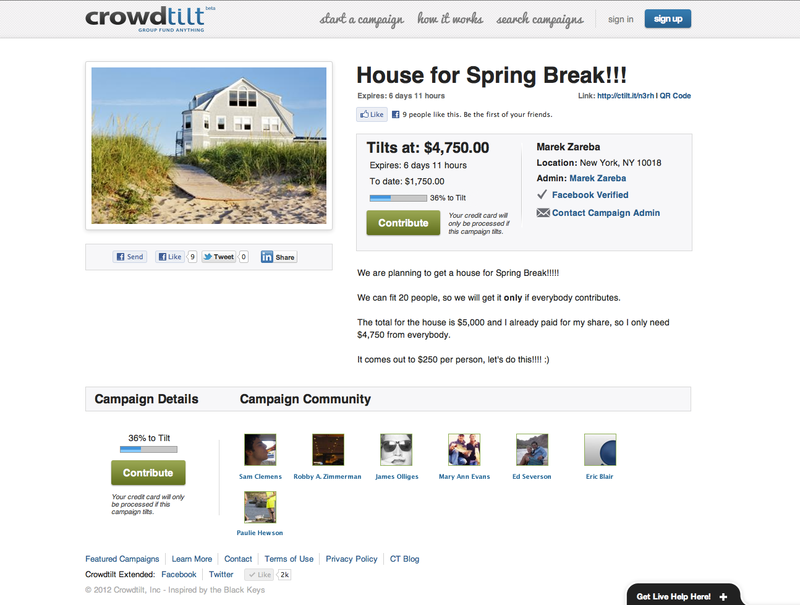 Check out Crowdtilt at home here, and let us know what you think.